This card has a fairly narrow use, but man can it be powerful in the right deck. 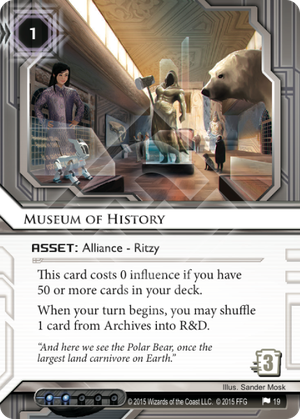 This card's most obviously useful in decks like Industrial Genomics: Growing Solutions and Gagarin Deep Space: Expanding the Horizon where recursion of assets and archive control is useful. But this card has some other powerful side effects as well. It's not just getting back your cards, it's that you're able to shuffle your R&D each turn. This can make cards like Medium, Indexing and other R&D lock mechanisms much less effective. Additionally, because this is neither unique nor expensive, it's not impossible to get a situation going where you are putting three cards back into your R&D every turn, reducing Agenda density substantially. I can easily see this being the first in a series of cards that encourages and powers larger sized decks. Fun stuff! 2 influence or 50+ cards makes this kind of hard to use, but: if you can protect it, this card makes you immune to R&D lock. Also: Aibo! And is that Ronan the Accuser in the background? The first thing I thought of when reading this card, and I'm surprised no one else has mentioned it yet, is that it would be quite helpful vs Noise. There are far too few cards that fit that description in my opinion. Off the top of my head, I'd say a virus spamming Noise installs about 1.5 viruses per runner turn. Having one of these in play would greatly reduce the damage of Noise's extremely powerful ability. IG does seem the best fit for this card. The featured deck this week looks scary! Outside of IG though, I'm not sure it'll see too much play. But you'll be happy you have it if your facing Noise. So I guess I was wrong. This card is very widely used. It's the new thing to build IG, NEH, Gagarin, Palana, and other decks at 54 cards with 3 of these included. Often with 3 Mumba Temples and either Hostile Infrastructure and/or trash cost boosters. I have to say, since I've been playing mostly as the runner recently, it is getting really annoying, really fast. The new Mumbad City Hall has obvious synergy with this set up. Honestly it seems way too powerful, because Mumbad is free after the 1 rez cost and can be used repeatedly to get all 6 of these cards installed (not to mention any other Alliance cards).